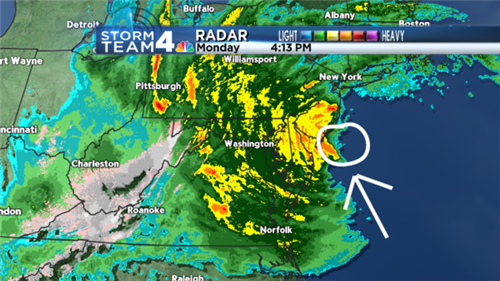 Get the latest updates on the "Frankenstorm"
According to one indicator, Sandy isn’t looking so bad (yet). “Right now all our restaurants are open,” says Pat Warner, vice president of culture at Waffle House. The so-called “Waffle House Index” has become an unofficial indicator of sorts, telling how disastrous a natural disaster is. The restaurant has gained a reputation for being open when other businesses aren’t. The head of FEMA has helped to popularize the idea of the Waffle House as a disaster measure. “If you get there and the Waffle House is closed?" FEMA Administrator Craig Fugate has said, as quoted in the Wall Street Journal after Hurricane Irene last year. "That's really bad. That's where you go to work." The company is working hard right now to keep restaurants in Sandy’s path in business. Currently, it is trucking supplies to what Warner calls a “staging area” in Richmond, Va. That city he says, will be a good central location to get supplies to restaurants in Virginia, as well as Maryland and Delaware. “We have a trailer full of waffle irons [and] small generators that can run refrigeration of a restaurant,” he says, adding that the company also plans to truck in bigger generators that can power an entire restaurant. He adds that not only are all restaurants currently open, they are all still on full menus. Losing power can mean a reduced menu. Federal government offices in Washington CLOSED on Tuesday because of #Sandy, OPM says. 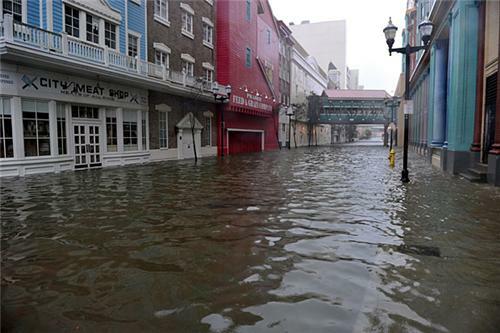 A flooded street between two casinos along the Atlantic City boardwalk before the arrival of Hurricane Sandy (Photo credit: Stan HondaAFP/Getty Images). FEMA Administrator Craig Fugate hasn’t ruled out the possibility that Hurricane Sandy could have a major impact on the presidential elections. “We are anticipating that, based on the storm, there could be impacts that would linger into next week and have impacts on the federal election,” Fugate said Monday during a conference call with the media. It is still too early to predict how long Sandy’s effects will linger. However, it is possible that power outages could stretch well into next week causing major headaches for election officials. While federal laws dictate that presidential elections must happen the Tuesday following the first Monday of November, some state election officials have the power to make other arrangements. In Virginia, for example, the governor can hold the elections up to 14 days after Election Day. The Labor Department is now saying that this week's jobs report will come, rain or shine, and ADP is saying the same of its report. The payroll processing firm releases its own private-sector jobs estimate shortly in advance of each month’s government report. Michael Schneider, a spokesman for ADP, says that the company still plans to release its October jobs figure on November 1 at 8:15 AM. 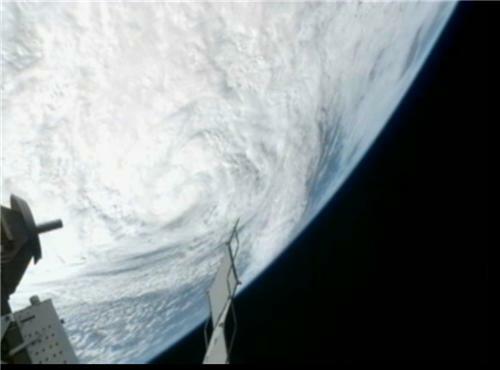 Hurricane Sandy as seen from the International Space Station. Image courtesy of NASA. 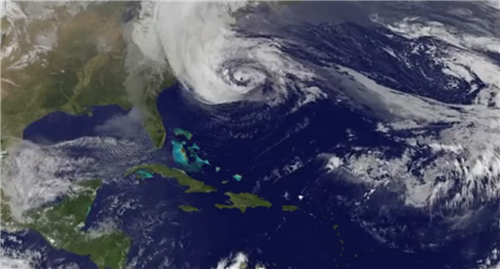 Hurricane Sandy, from space. Image courtesy of NASA. The folks over at NASA have pointed their satellites at Hurricane Sandy over the past few days, and from several miles up the view is almost serene. 1.6 million customers without power now due to Hurricane #Sandy. You are going to be shocked when you see the images coming out of the Jersey Shore. 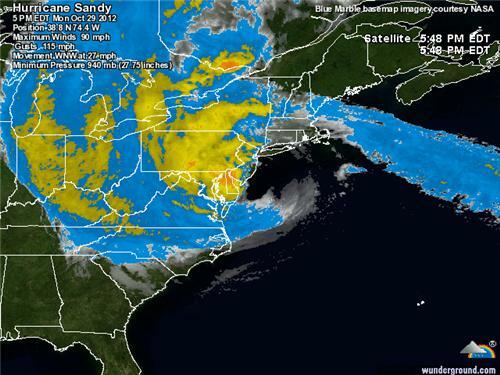 Hurricane Sandy making landfall. Image courtesy of NOAA. 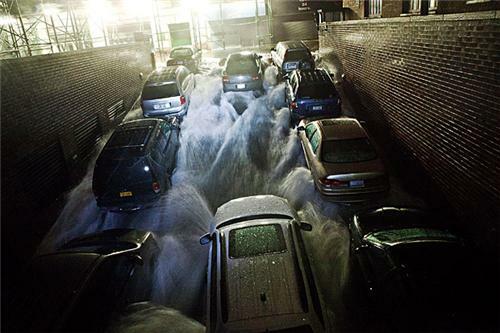 Rising water from Hurricane Sandy rushes into a parking garage in the Financial District of New York (Andrew Burton/Getty Images).